Better Packages was the innovator of water activated gummed tape dispensers used for carton sealing in 1917. Before then companies used twine, glue, or staples to close boxes. Today gummed tape machines are used by large internet businesses and still plays an important part in making sure cartons are securely sealed for shipping via small parcel service. Even though plastic tape cost half a much, using multiple strips to seal a box ends up costing more than Kraft gummed tape in materials and labor. We have pictures!!! Click here. At one time there were only about 36 regional distributors for Better Packages working with a small number of resellers. Today the marketing with the Internet, BPI is now available from hundreds of resellers, however only a handful of regional distributors have survived. We offer the full line of machines, parts, and service with the knowledge to back the product line. We have parts lists and service information for machines that have not been produced in the last 20 years. Many of today's distributors are unable to answer questions over the phone. If you have experienced problems getting answers, give us a call. Better yet, if you want to connect via video, call and get more info on our live service help. Click and follow your model below for all the info needed to purchase and maintain your equipment with pdf files and video clips. We encourage you to download the instructional videos for either operators or service members on maintaining your dispensers. Discontinued models are listed below the current models. We are one of the original AUTHORIZED Distributors and Resellers for BPI. BP333 - Most popular manual water activated gummed tape dispenser for up 3" tape width. Optional heater available. BP500 - The "Retro". Built on the same platform at the original pre 1999 BP555 series with electronics and great features. BP500IJ - Better Packages BP500 with optional Ink Jet System for Coding Tape. BP555e - with and INK JET PRINTER! Code and identify your tape with dates, shift, or contents using the MSSC Smart Jet Printer. Adaptable to all BP555e models. BP555eS - Most popular electronic water activated gummed paper tape dispenser. SJP-555eS - Most popular with the Smart Jet ink jet printer to add code dates, lot numbers, expiration dates, or other identifying information on the tape as it is dispensed. BP555eL - Electronic dispenser replacing the BP555LL and BP555LLS models. Pick your keypad and click on the picture to go to the machine. Note the number of repeat keys and length for the selector buttons. (Optional Metric lengths available with 220v models.) Create a Total System Solution with the AMD, CodeTaper, Single Foot Threadle, Double Foot Threadle, and Tape Aerial. BP555eSA - Most popular electronic water activated gummed paper tape dispenser with automatic dispensing features. SJP-555eSA - BP555eSA with the Smart-Jet Ink Jet printer to code, date, and identify tape as it is dispensed. BP555eLA - New Automatic models replacing the BP555, BP554, and BP556 but with the longer lengths. BP-6 Formerly KL-6 - Label moistener for up to 6" wide gummed labels. BP755eS - Electronic model dispensing 1-4” wide gummed paper or reinforced tape in predetermined lengths of 6”-75”. BP755eSA - Electronic model dispensing 1-4” wide gummed paper or reinforced tape in three different modes with time delay. Choose from a 1-2-2 pattern, manual, or automatic single length modes. Two variable length buttons from 6”-100” and an overriding random length button. Ink Jet System - Code, date, and identify directly on gummed tape as it is dispensed with an ink jet mounted on a BP500 tape dispenser. Packer 3S - Pull & Tear dispenser for 1-3" paper gummed tape incorporating a unique subway feed. The "Mom and Pop" dispenser for small home based businesses looking for the best value with the most security. Penetron Concentrate - 8 oz. convenient bottle that when diluted makes 50 gallons of Penetron. PS2a - 2" Electronic Pressure Sensitive tape dispenser with automatic dispensing. TS404 - Lever operated manual paper tape dispenser for 1 1/2" gummed side out tape for bakeries, pizza parlors, and print shops. AMD - Automatic Measuring Device. Measures cartons and the one push of a button or optional foot switch the correct amount of tape is dispensed. Fits the BP555eSA. CodeTaper- Tape printer attachment to print on tape as it is dispensed. Very useful for logo, dating, or noting shift or product information. Used on BP333, BP554, BP555, BP555e, BP556, BP754, BP755, CB33A. Supplies for the CodeTaper, click here. Single Foot Threadle - Double Foot Threadle - Hands free operation for the new BP555e models. The old style BP554 Duet, or BP556 Robot used a similar device. BP3000CS - Discontinued. Gummed tape Case Sealer for fixed size cartons. BP333SS - Stainless Steel dispenser for tapes up to 3" widths that can be washed down. BP400 - Discontinued 1996. Random length. BP554 - Discontinued 1999. “Duet” two length gummed tape dispenser from 6-84”, 1-3” wide. Replaced with the BP555eSA. BP555 - Discontinued 1999. See the BP555eSA. Multiple length dispensers for 1-3” gummed tape. 5 models to choose from. Click here for The Retro. BP556 - Discontinued 1999. “Robot” dispensing in 3 different modes from 6"-54” single length tape. Choose from manual, random, and robot. Replaced with the BP555eSA. BP754 - Electronic model dispensing 1-4” wide tape. Replaced with the BP755eS. BP755 - Electronic model dispensing 1-4” wide gummed paper or reinforced tape in predetermined lengths of 6”-75”. Replaced by the BP755eSA. BP900e - Discontinued. Better Bagger for making your own bags from poly tube stock. CB33A - Discontinued. Heavy duty manual gummed tape dispenser for 1-4" wide gummed tapes. Optional top heater available. DL-9 - Discontinued 2001. Cast iron 9" wide label moistener for gummed labels. See an option here with Potdevin or here with GlueFast. Express 1 1/2 - Discontinued 2001. Pull and Tear dispenser for 1 1/2" 35# gummed side out paper tape. See the NPS No. 31 Pull & Tear for up to 1 1/2". Penetron 24 and Penetron 100 - water conditioner for all types of gummed material. Makes tapes stick faster. Discontinued 2001, see the Penetron Concentrate. Simplex 3 - Discontinued - Basic Pull & Tear dispenser for 1-3" paper gummed tape. Simplex 10 - Discontinued - Dispensed 1 1/2" gum side out tape. TS100 - Old red reliable. Discontinued Fall 1998. See BP333. Cast iron manual gummed tape dispenser for 1-3" wide gummed tapes. TS150 - Discontinued. Heavy duty manual gummed tape dispenser for 1-4" wide gummed tapes. Optional top heater available. Tape Squirt - Discontinued 1998 - Fast acting water agent. 8 ounces treats 40 gallons of water. See Penetron Concentrate. Click here to find out why gummed tape is better. Click here to find out the advantage of gummed tape dispensers over case sealers. 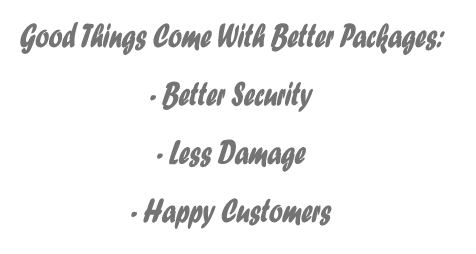 Interested in the benefits of Better Packages Equipment???? Already own a gummed tape dispenser? Since 1958, the BP555S and BP333 models have served businesses well delivering value and increased security and safety for the cartons being shipped. The advantages of gummed tape are found on our web page “Advantages of Gummed Tape”. © COPYRIGHT ©2016 BETTER PACKAGES | ANSONIA, CT. ALL RIGHTS RESERVED. Better Packages, Better Pack, CodeTaper, TapeShooter, BP SealMaster, BP E-Z Pull Tab, Better Pack Tape™ and Packer are registered trademarks of Better Packages.